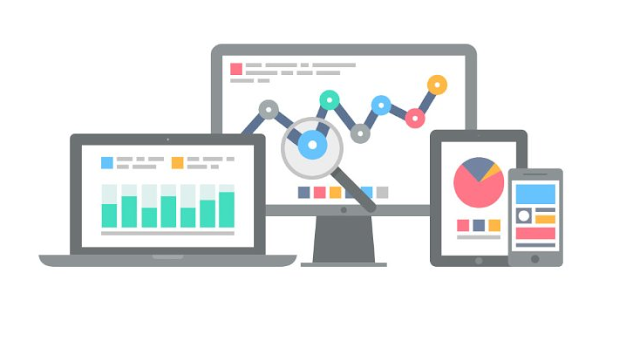 Salesforce gives a powerful option for generating reports on the data stored within salesforce in custom and standard objects. The wealth of information can be filtered, grouped sorted using reports. The data displayed on the reports is as per the user security access. Reports are stored within folders. A user can run the report if it has access to the folder where report is stored. In this post we will see how to create custom reports in salesforce, different report formats, and other features of reports that are available for usage. A report is a list of records which meet your defined criteria. Records are displayed in rows and fields in columns. Reports can be filtered, grouped or ordered as per the business requirements. Reports are to be stored in folders which can be public, hidden, or shared and can be read only or read write type. Folders access can be controlled using roles, permissions, public groups and license types. Before building a report an important think to consider is "Report Type". Once you have finalized the requirements you need validate whether you have a report type that suits your requirements. 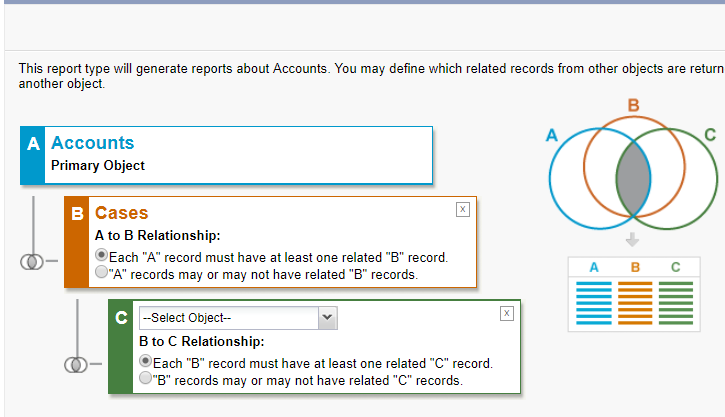 creating reports in salesforce needs that you identify your requirements and then determine the report type for it. Report type is a skeleton using which reports are to be built. Custom report types let you to create a new framework in the report wizard, using which administrators can build and customize reports as per needs. 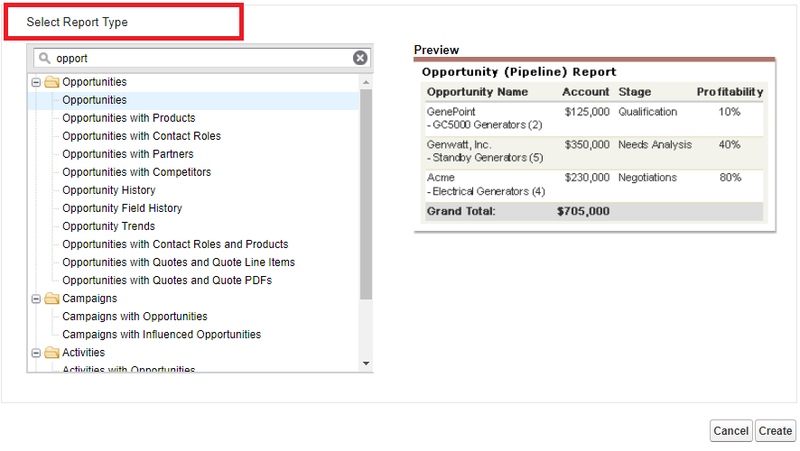 Reports type defined which fields are available for use in a report. There are two type of report types that is the standard report or the custom report. Standard report types gives access to most of the standard objects while custom report types gives access to custom objects and custom views of standard objects. While creating a new report you need to select a report type and then start building the report. Depending on how your report type is structured you will have options to drag fields on to your report. 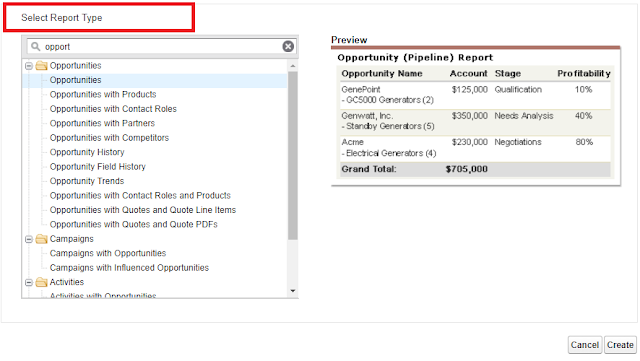 In report type you need to define the primary object and related object fields which you will need while building the report. A report will display records that meet the criteria set in the report type hence it is important to create proper report type before building the actual report. Salesforce also provides lots of standard report types which can be used in building new reports. >> Navigate to set up, and search for Report type under create. >> Then need to select th primary object that you need for your report, give in description, name, category for the repprt type and click next. >> The next step is to define the records set that is defining your related objects and then click on save. Before building a report you need to define your requirements, identify the objects which will be needed for building the report, check if there are any standard report types that provides all the objects needed, if not create a new report type and start building the report. Next thing will be define the filter criteria, group, order as per requirements. A user needs to have Create and Customize Reports AND Report Builder permission in order to create, delete or customize reports. For creating reports in salesforce follow below steps. >> You need to select the type of Report you want to build that is you need to select the report format, this will depend on what your requirements are. There are four different format of report that you can have and those are tabular, summary, Matrix and Joined reports. A Section below has all the details about each of the report types. >> Next thing to do within report builder is setting the criteria for displaying the records. Here you can select date range for different date fields of the object. Also you can drop fields in filter criteria area and build your own criteria for which you can use different logical operators as well. >> Next you can run report to see if it working as per your needs and then save the report in desired folder. While above are basic steps in building reports in salesforce you can customize your reports using other things like bucket fields, summary fields, subtotaling, smart totaling, joining reports using joined reports, building dashboards using the reports (except for tabular format). While creating reports you need to select the format of the report. Below are the different Types of Reports and their details. Tabular report format is a simplext of all and very easy and fast to build. As its names suggests it a simple tabular display of record just like a spredsheet. Its a simple way at looking rows of records with ordered set of fields in columns. Tabular reports give a simple subtotal at the end of the report. These type of reports canot be used for grouping of data or for dashboards. Sumamry reports are similar to tabular reports but these allow grouping rows of data. Also you can view subtotals and you can create charts in this type of reprots. Unlike tabular reports you can use summary reprots as source for building dashboards. If yu dont use grouping in this reports it looks exactly same as tabular report. Matrix reports are little enhanced and are similar to summary report with a difference that you can summarize on both rows as well as columns. Like summary reports this can also be used as source for building dashboards. Joined reports are the most enhanced ones and were incorporated the last in the list of report formats. With joined reports you can have multiple report blocks that gives different view of data. Each block here acts like a separate sub report with its own fields, columns, filtering and sorting. A joined report can also contain data from different report types. You can change an already saved report format but that may impact few things and you need to go through the salesforce documentation before you change the format. Bucket field in salesforce reports helps you quickly categorize records without having to create new formula or custom fields. With bucket field you can define multiple buckets which can be used to group report values. To build a bucket field you need to drag the bucket field on report and then define the bucket values as per need.